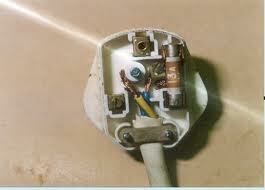 This plug clearly shows the outer casing cracked and therefore exposing live and potentially hazardous components. Our engineers will replace plugs damaged in this way Free of any charges. At NVPC our fully qualified engineers will replace or replair this plug and make sure that it is perfectly safe for use after at no extra cost to you.